After a very over indulgent summer holiday Mr B and I are now on a mission to get back into shape and start eating more healthily. Regular BeachBody workouts are back on the schedule at Casa B and we are aiming to ‘eat clean’ 70-80% of the week. As my fitness buddies keep telling me, abs are not made in the gym, they’re made in the kitchen. We tried this recipe for the first time last week and it was AMAZING. It also made the kitchen smell incredible. It is a slightly adapted version of a recipe by James Duigan whose Clean and Lean Diet Cookbook I would thoroughly recommend. Delicious and part of the Clean and Lean diet. 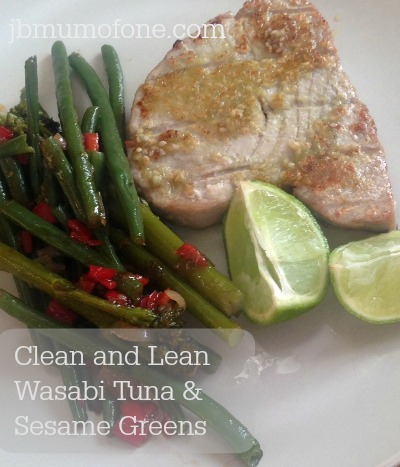 Mix together the wasabi paste, olive oil and sesame seeds and rub all over the tuna steaks. Sear the tuna for 2-3 minutes each side then set aside. In a frying pan heat the sesame oil, add the chiles and shallots and toss for 2-3 minutes. Then add the beans and broccoli and the oyster sauce. Continue to cook for 8 minutes then serve with the tuna and lime wedges. If you do give this one a try please let me know what you think. We loved it! « How to pay with cash online: Try Ukash! Very yummy looking Jenny! Yum! Sounds utterly delicious. We too are on a mission to eat more healthily. I’ve actually got some salmon out for dinner, I might try this instead of tuna. Thanks for the inspiration!